Lay your table in the most sophisticated way. Bring home our signature dinner sets, a perfect amalgamation of fine porcelain & indigenous design inspired from ancient & modern ages of world culture. Give your guests the experience of savoring the delectable delicacies, a whole new taste , with our exclusive dinner sets online. Entertaining now comes with a new élan. All your dinner dos, will have a new addition in the menu - our premium dinner sets, now available online. A magnificent combination of majesty, stateliness and class, these dinnerware sets are just what you need while preparing your dining table for the special occasions. Available in a set of 21 pieces with 6 Dinner Plates, 6 Quarter Plates, 6 Portion Bowls (Katori), 1 Medium Bowl, 1 Small Bowl, 1 Round Platter & 1 Oval Platter. 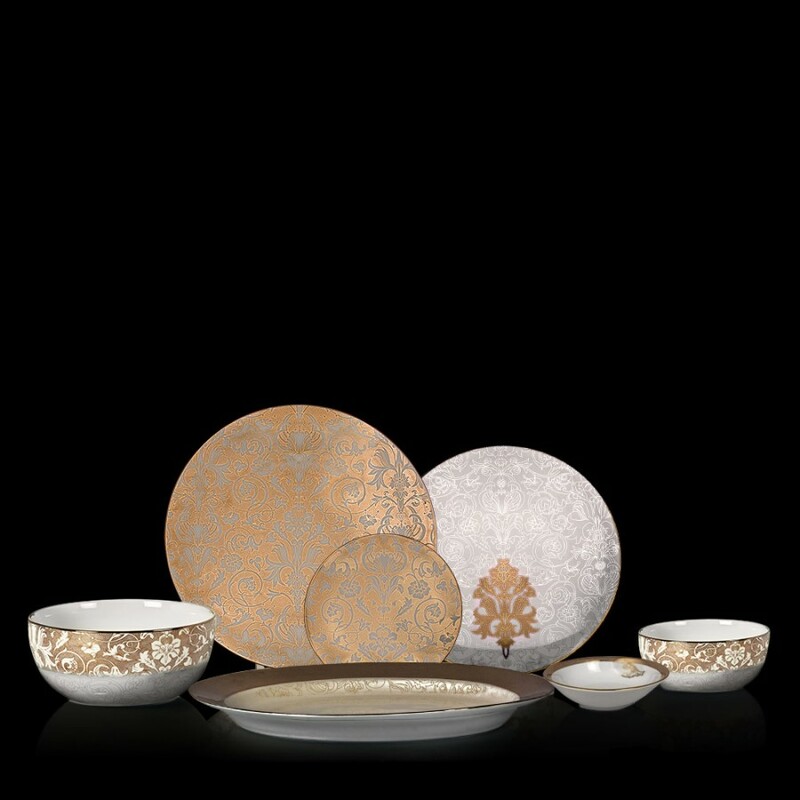 Serve your guests some lip smacking delight topped with the luster of our dinner sets. An evolved design philosophy further makes these iconic dinner sets a cherished possession that look stellar on your cabinets as well as your table settings. Our Nizam collection brings a majestic aura with regal jewels etched on the surface; as does Meenakari the enchantment of lapis lazuli with ruby & gold. The Taj dinner collection carries the essence of The Taj Mahal, painted in gold here; while Falaknuma offers the palatial majesty with added color accents. Mervielle is here to shine a silver lining to your dreams, with its Italian edge; Noir graces the monochromatic style a Roman highlight, and Izmir plays platinum subtly with Moroccan patterns. Then arrives in an eclectic royal Indian procession of colorful palanquins, elephants & Rajasthani marionettes through our Kathputli dinner set. With such majestic entities accompanying you for dinner, you will be transported to an era of imperial opulence. Come dressed for the occasion. Personify your living experience by relishing an experience full of fun & bliss with our exclusively designed Bed Linen, Tableware, Home Decor Accents, Candleware & more. Add luxury to your lifestyle.